298 So Passes The Torch. My dog is sitting behing my chair. She’s having a dream, and woofing in her sleep. Wow, I’m almost starting to feel sorry for John. He may just become the woobie of your story. Green DS? Is that a between failures original??? Wow, Thomas just keeps getting more and more awesome. A GREEN DS?! I WANT ONE! Next to purple, that’s my favorite color! Heck yeah Thomas! Double good deed! … He has… ohhh dear…. He needs to get rid of that scarf. It looks like it belongs in slytherin, no wonder. Gotta love Blackwell. Great guy. Haha, loved your little comment. I have my cat on my lap, and she’s just purring away. Considering the comic though, I liked this a lot. It’s a touching, yet casual moment (kinda makes me think of something from the FANBOY’S comic, and makes me wanna get a DS to play with my best friend <–I’m not saying you’re copying, at all, it’s just a similar moment that I find very touching, so it’s a good thing!). Also, considering art, I think many people overlook your artistic prowess in this one. I think you drew those DSs very well. Giving good 3-D effects along with light and shading for such a small thing in the comic. Good on ya Crave. Ew… gross…. a Green DS. At least mine is Silver…. and one of the originals; not like that Lite crap. The dissing of the DSlite is unforgiveable. It trumps the original DS in so many ways… but I am eagerly awaiting the release of the DSi in America. It combines the awesomeness of both predecessors into one magificent, portable machine of incredulity. My DS has yet to let me down. I see no reason to upgrade. Haha, there’s an actual green DS now. :) It came out last year in Europe, and then they released the same bundle here over the weekend. It comes with Personal Trainer: Cooking and a custom carrying pouch. It’s not that kind of medium green color though, it’s more neon lime green. Dude, having read the story until ep. 638, I dare now say that it’s awesome to see resemblance between me and Thomas. 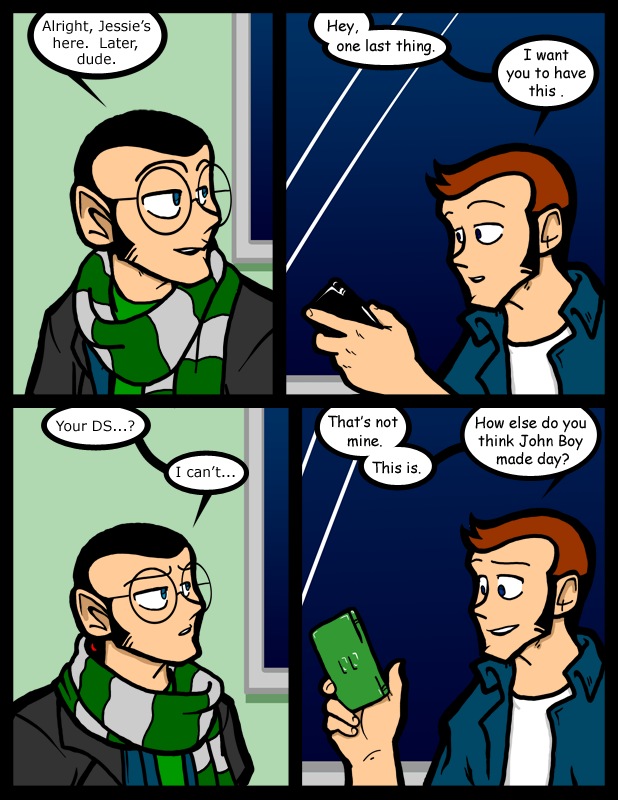 Seeing as I own both a black and a green DS Lite. I have seen the DS in black, white, silver, pink and if I recall correctly, red.